Why Edge is the best browser for Windows 10 users? Home Apps Why Edge is the best browser for Windows 10 users? 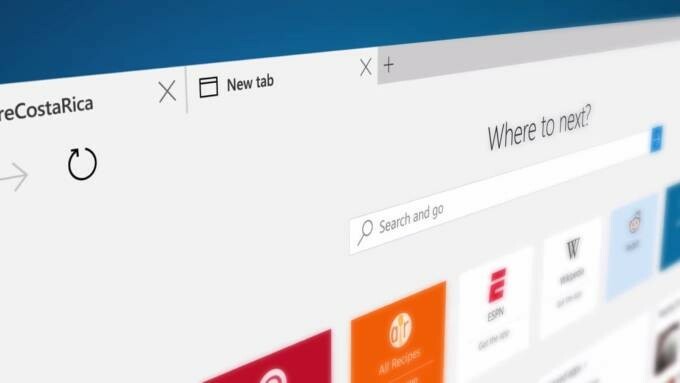 Windows 10 comes with a whole new browser,i.e. Edge aka project SPARTAN. The good news is, EDGE is fast with a user friendly interface. The bad news is, there is not a lot to offer to Chrome users. Project Spartan was started from scratch with a user friendly interface. The home screen of EDGE contains news-feed updates and more, just like iGoogle homepage and a welcoming search bar with the title “Where to next?” . Edge UI contains only basic controls required for general operation i.e., bold icons, wider tabs than the traditional slimmer ones in google chrome. Address bar contains buttons such as HUB giving easy access to favorite bar, reading list, history and downloads, web note button, share and more actions. Bold icons and wider tabs are easily accessible by touch users resulting in better user experience. Also, the light colored theme seems clean and simple. The best part of EDGE is, it is boosted with performance. Browser wars will go on and then we will eventually find ourself at a position when these browsers need to be put at rigorous tests. EDGE dominated load time which proves its speed and performance. But despite the good looks, Microsoft EDGE seems to be a RAM eater. We used task manager to sum up the calculation, and here it goes wrong. 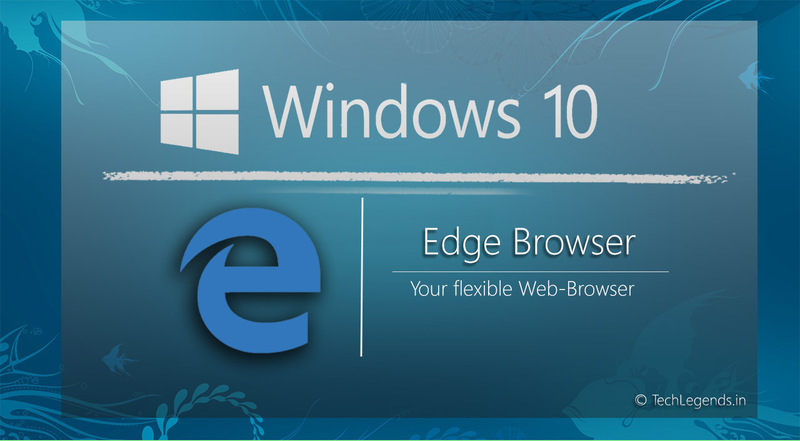 Even if EDGE looks simple and light weight, it consumes a lot of RAM and puts more pressure on your system as compared to Google Chrome. But digits don’t matter if you have a decent piece of hardware. 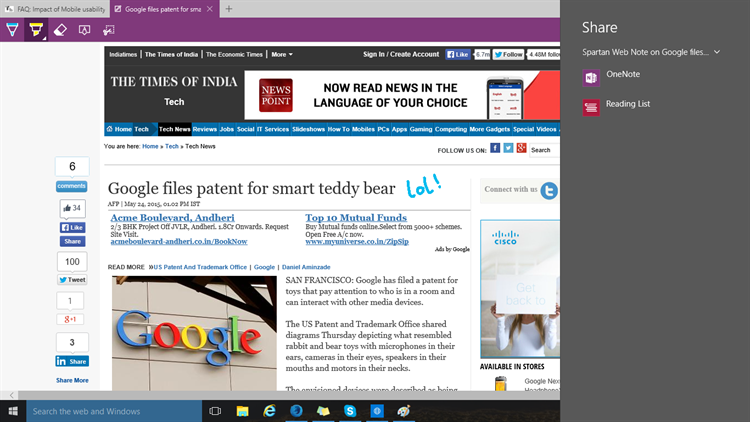 Being new to the market, Edge performs pretty well and hence, proves itself as the browser which Windows 10 deserves. 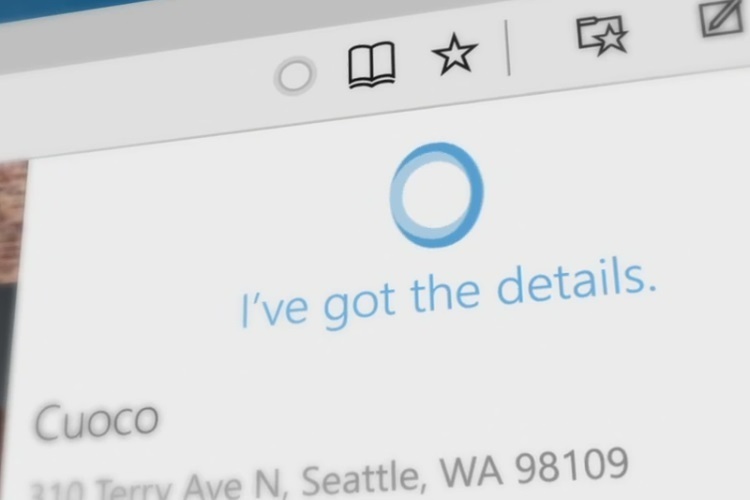 The browser is integrated with the best personal assistant ever made in the history of mankind, “CORTANA”. Browsing internet? Stuck with something? 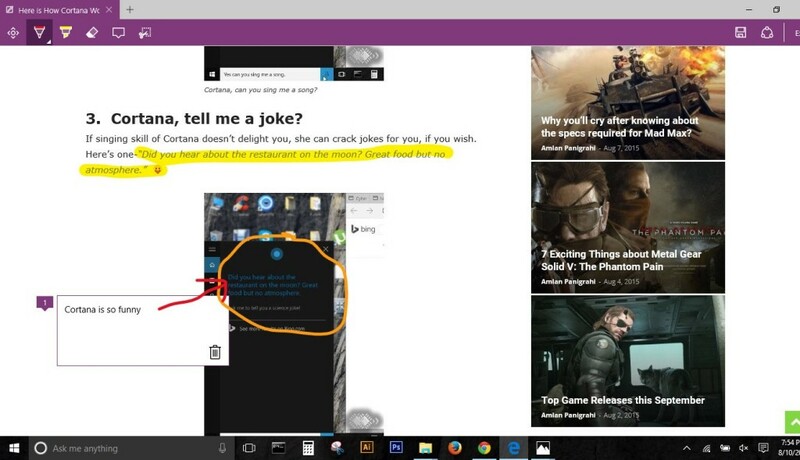 Then you don’t need to worry, as Cortana has got your back. Just a right click, and ask her about anything on the internet. And yeah, she’s sarcastic too. It will be the first time that a Microsoft browser will support the mighty extension of Chrome. We don’t need to prove the power of Chrome extension, as Chrome books are sold only because of Chrome OS and the powerful extension it supports. However the feature is not available right now. You’ll get this cool update soon. Need to take notes online? No need of opening one note or launching snipping tool for that because EDGE is already providing all those features. You can take a snap, add a note or just highlight text. All the data you surf, all the web notes you’ve got, even the selected text can be shared right away without opening another tab of Gmail or another email client because this feature is also built inside EDGE. You can also access this amazing feature through the share icon near the address bar. This mode gives an amazing reading experience although, I am not a fan of books and stuff. Be happy as, you won’t get any privilege to view ads, hyperlinks,etc. as the reading mode offers you an environment similar to reading a text book. Basic and simple, isn’t it? Webpages can also be saved for future reading sessions in the reading list option. Because the browser is new and was built from scratch, there’s a lot of work yet to be done and facing some minor bugs is not an issue, as they will be patched in the future updates. Problem in switching multiple tabs using shortcut keys. Major issues with touch devices, sometimes. Slow response in scrolling web pages. Thanks to the frequent updates promised by Microsoft, we hope these bugs will be patched soon. EDGE proved itself that it is very powerful but regular Chrome users might not want to switch to EDGE but it’s worth a try. Tell us which feature of EDGE you use frequently and do share with us if you are facing bugs apart from those mentioned above. Dheeraj is an android enthusiast and an avid gamer, currently pursuing his B.Tech degree from KIIT university. Apart from being a keyboard commando, he listens to Linkin Park and gaming soundtracks in his leisure time. His motto is "never back down".